NEMA 1 construction for single phase units. NEMA12 combination disconnect with 110 volt control circuit power for three phase units. Standard heat supplied by NEMA 1 strip heaters or optional stainless steel immersion screw plug heaters. Digital indicating temperature controller with type J thermocouple standard on all three phase units. Bulb and capillary thermostat with thermometer standard on singlephase units. Optional NEMA 7 construction available. Standard construction of compound tank is mild steel, 10 gauge thick, with all liquid bearing seams double welded inside out, and leak checked after each welding pass. Optional type 304 stainless steel construction available. Three inches of insulation on the bottom and three sides. Insulated lid with fusible safety closure. Outer shell constructed of 16 gauge mild steel and finished in Polane® polyurethane enamel. Full length stainless steel hinge on lid. Optional 7 day timer and high temperature cutoff with manual reset and optional alarm available. Optional circulating pumps and filter are available for a wide variety of applications. Optional pneumatically operated lid. 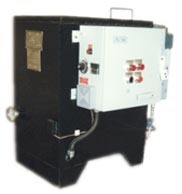 For hard to heat or process operation tanks, see our line of oil jacketed indirectly heated tanks. DIRECTLY HEATED DESIGN uses bottom or optional side and bottom mounted strip heaters to directly heat the compound to be melted. Provides quick heat up of compound. INDUSTRIAL DUTY INSULATION with three inches of fiberglass insulation on the bottom and four sides for improved thermal efficiency. Insulated lid improves heat up time and limits heat losses due to convection.